I appreciate the beauty of and skill involved in the design and creation of American buildings, signs, furniture and other items from the dawn of Art Deco in the early 1900s through the exciting, stylish and solid construction of the 1950s and early 1960s, before the decline. The 708-foot tall Terminal Tower, pictured at right, is the best-known part of the Cleveland skyline and the city's number one landmark, although it is no longer the tallest building downtown. When it was completed in 1930, it was the second-tallest building in the world! It gets its name from the rapid transit terminals, which run underneath the building and spoke out to the various suburbs. CSU's C.U.T. Collection houses many vintage views of the building, and there are plenty of other sites with facts and photos. A live webcam on the side of the building is pointed on a nest of peregrine falcons. 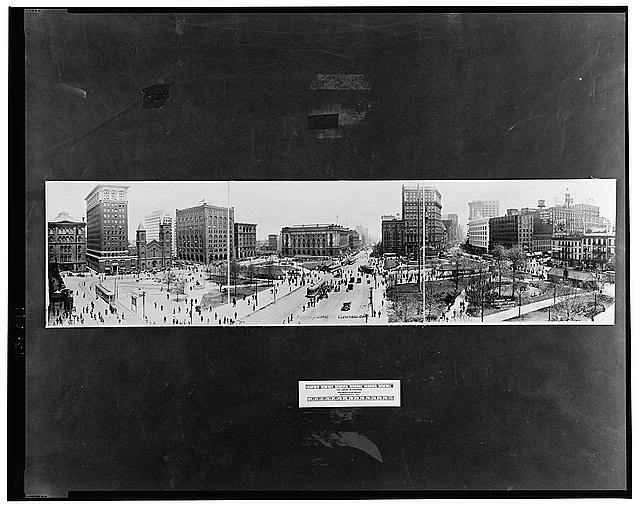 The Library of Congress has a vintage panoramic shot of Public Square before the Terminal Tower was erected, just one of a great many images in their American Memory collection in the National Digital Library. 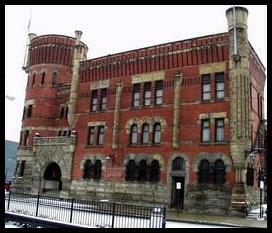 Cleveland Grays Armory, aka the Cleveland Armory, is the downtown "castle." One of the oldest remaining buildings downtown, it predates the Civil War. Built by a local militia, the Cleveland Grays (founded in 1837), it was awarded a historical marker on Veterans Day of 2003. In former days, it hosted all kinds of cultural events; before Severance Hall was built, the Cleveland Orchestra played here. Mario Lanza made his local debut there in the 1950s when Bill Randle brought him into town, and Alan Freed hosted a rock and roll dance there in 1952 that brought in between 30,000 and 40,000 people. The Armory was also host indoor model airplane flying contests back in the 1930s and '40s. Cuyahoga County Library hosts the Cleveland Grays Archive. The West Side Market is Cleveland's answer to Seattle's Pike Place Market. 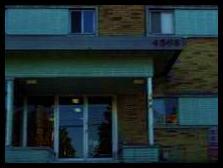 It's located in one of the older neighborhoods in Cleveland, Ohio City. When it was built in 1912, the mayor of the time deeded the land with the stipulation that it must always remain a market place -- and it has been a very popular marketplace ever since. Fortunately, the market has retained much of its character over the past century; its beautiful Neo-Classical/Byzantine architecture is still evident, and the "Old Country" feel of the many different stands (of many different ethnicities) is always prominent. 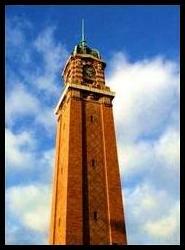 Their official site hosts a set of images of the West Side Market, both vintage and recent. Squire's Castle, located in the Chagrin Reservation of the Cleveland Metroparks, was intended to be merely the servant's residence for an elaborate, sprawling mansion on over 500 acres of land that was never built. Mr. Squire was an oil magnate, a founder of the Standard Oil Company. It's been said that the ghost of his wife still lurks in the halls of this structure, where she tragically and mysteriously died. They say that she can still be seen in the windows, carrying a red lantern -- but to myself and many others, Squire's Castle always meant a fun place to play as a child and hang out as an adolescent. Don't let the poorly designed new Metroparks sign put you off -- the structure is really much more interesting and fun to explore then the signage would lead you to believe. Directions for how to get there are available. Little Italy's Alta House was established by John D. Rockefeller in 1900 and named after his daughter, Alta Rockefeller. Early Italian settler, Joseph Carabelli, was a friend of Rockefeller and was responsible for convincing him to fund the Alta House construction. Alta has always been an important part of the Little Italy neighborhood -- during the Great Depression of the 1930s, it was used as a center to distribute distributed rice, barley, milk and potatoes to the needy today it's used as a community center and is used for the Meals on Wheels program. The Barton Center opened in 1964. 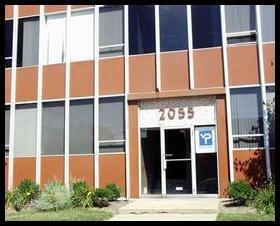 It's located on the ground floor of Lakewood's early-60s Space-Age era Westerly Apartments. This senior activity center was the first of its type when it first opened, and is still a model for senior centers today. 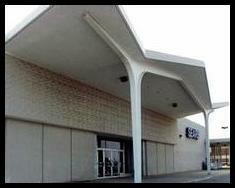 Southland Shopping Center and the area surrounding it in Parma Heights is a beautiful paean to the space age. Notably, the Parma Heights branch of the Cuyahoga County Public Library was the first circular library when it opened to the public on June 16, 1963 with its spectacular Googie architecture, and the Sears department store wing across the street looks like a moon base! 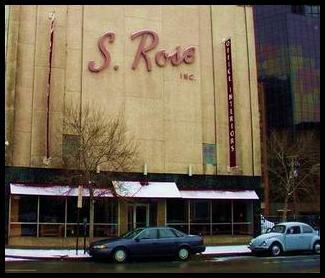 A landmark of the Theatre District, the S. Rose building on Prospect was built in the early 20th century. They've been selling quality office furniture since 1913. Fans of great American cinema will appreciate the landmark mural outside of Play It Again Sam in Lakewood, an evocative recreation of Rick's Cafe from Casablanca , with the silhouettes of Dooley Wilson and Ingrid Bergman. Humphrey Bogart is well represented in photographs inside the shop. The neons beckon you in to the Luncheonette at the Lakewood Lanes on Detroit Road in western Lakewood. Lakewood Lanes, in addition to the lunch counter and bowling alley, also houses billiards tables. The Colonial Eatery is a family-style restaurant that's been around for decades, and the outside still has the old colonial trimmings and original rooftop neons that are worth seeing. Cleveland has an official Designated Landmark List. The Blossom Music Center is the Summer home of the Cleveland Orchestra as well as other venues of various genres. Blossom is located in Cuyahoga Falls, about forty minutes south of Cleveland. Commissioned by former Cleveland Orchestra music director George Szell, the stage is housed by an award-winning, acoustically desirable open-air pavilion designed by architect Peter van Dijk. Blossom's first performance dates back to 1968. J. Adato, a percussionist with the Cleveland Orchestra, has written extensively about the Cleveland Orchestra on his Web site. He has a page on Blossom, and the Cleveland Orchestra also has a page about its summer home. Cain Park consists of an outdoor covered theater, an outdoor covered amphitheater, and an art gallery and is located on Cleveland's East side in Cleveland Heights. Cain Park dates back to the 1930s; see their web site for a history of the park. Cain Park, like Blossom, has picnic and walking areas. The Cleveland Institute of Music (CIM) building is located in University Circle; it's just a short walk from the Cleveland Botanical Gardens, the art and history museums and Severance Hall. Built during the 1950s, the current CIM building is a striking example of Mid-Century Modern architecture, and is the best in the University Circle area. Its "spider legs" reach out to the ground around the building (a popular early 1960s design element in Southern California, used by Neutra and the futuristic Los Angeles International Airport (LAX)). This well-known music institute was founded in the 1920s by Ernest Bloch, who composed some of my favorite cello music. The current 1961 building is not its original home; CIM has a history page which tells about the school's facilities and directors over the years. The Cleveland Music School Settlement (CMSS) was built in 1910 by J. Milton Dver, with the mission of providing "high quality music education to students of all ages regardless of their ability to pay." The CMSS currently consists of a few different historic century buildings, including a few large homes converted into lesson/practice rooms. The CMSS provides several talented instructors (a large number being Cleveland Orchestra members). Severance Hall is the home of the internationally acclaimed Cleveland Orchestra. When it first opened in 1931, Severance Hall was not only an exquisite example of art deco architecture, but also one of the most current, state-of-the-art concert facilities in America. The hall's interior used certain design elements to tie together the diverse styles of Art Deco, French Nouveau, Classicism, Egyptian Revival, and Modernism. Severance Hall's recent renovation (completed in January, 2000) is rare example of tasteful, thoughtful renovation. They have maintained the grand art deco design throughout the renovation. An interesting history of Severance Hall with photos, including its construction in the early '30s and the story of how this Cleveland architectural landmark came to be the home for an orchestra that, until then, had basically been "homeless." The Cleveland Museum of Art was designed by Cleveland architects Hubbell and Benes in the neoclassic style and opened to the public in 1916. There have been many exciting additions since CMA's opening, including the sleek 1958 styling which is most obvious on the inside and is nicely complimented by Barcelona couches in the front lobby. In 1971, Modernist master Marcel Breuer's design was constructed on the entrance side of the building by the parking lot. This is my favorite part of the building with its long lines and boxy late-Modern design. The Cleveland Museum of Art also has a notable collection, housing everything from ancient early Islamic art to Viktor Schrekengost's defining piece of the Jazz Age -- his Jazz Bowl. In addition to their vast and impressive collection, the CMA also offers several concerts (music and dance), lectures and films. Lakewood's Beck Center for the Arts has much to offer: plays; musicals; music and dance instruction and performances; and art education and exhibitions, including gallery exhibits by the Cleveland Artists Foundation. It is Cuyahoga and Lorain Counties' largest cultural arts center and their Youth Theater, established in 1948, is the oldest operational youth theater in the country. The Beck Center was founded in 1933, and has operated as a professional theater since 1998. Holy Rosary Church, known through-out Cleveland for their annual Feast of the Assumption celebration, was first founded in 1898, but the current building, a landmark in Little Italy, was built in 1908. It was the second Italian parish in Cleveland. There is a pencil rendering of Holy Rosary. St. Rocco's, located in Cleveland's Clark-Fulton area, was the first Italian parish on the West side of Cleveland. The school and church were built in 1926. St. Stan's is a magnificent Gothic-style church. The first cornerstone was laid in 1886 and construction was completed (by William H. Dunn) in 1901. St. Stan's is located in the heart of the Slavic Village neighborhood. Immaculate Conception Church, on Cleveland's near-east side is another beautiful example of Gothic architecture. Built in a (once) predominantly Irish neighborhood, this beautiful church dates back to 1865. Immaculate Conception Church is also one of the few Catholic churches in Cleveland that still offers the traditional Pre-Vatican II Latin (Tridentine) Mass. St. Stephen's Church is another Gothic style church. Construction was started in 1873 by Cudell and Richardson and was completed in 1881. St. Stephen's is located in the German and Irish settled Detroit Shoreway neighborhood on West 54th, between Bridge and Lorain Avenues. St. Paul's Chuch is another of Cleveland's one-hundred-year-old-plus churches. The parish was first founded in 1843; this classic Art Nouveau building took 15 years to build with construction completed in 1860. Cleveland Sacred Landmarks lists more landmark churches; even more information, including photographs, is contained in the book, A Guide to Cleveland's Sacred Landmarks , by Foster Armstrong et. al. The Ohio Cemetery Project and Ohio Tombstone Photo Project are two very interesting sites tracking Cemeteries and tombstones in the state of Ohio. "Many dangers face our cemeteries; such as weathering, commercial development, neglect, abandonment, vandalism and theft. The Ohio Cemetery Preservation Society (OCPS) has been formed as a response to the public's increasing awareness and appreciation of our historic cemeteries and the need to protect them." Check out the OCPS website for more information on endangered cemeteries, a list of Ohio cemeteries, restoration projects, membership information and more. Lake View Cemetery is the area's most famous cemetery and it has got a rich history. Noted for its Victorian Romantic design, famous residents, elaborate Italian sculptures and tombstones, "Cleveland's Outdoor Museum" is a must-see. The Rockefellers, President Garfield, and Eliot Ness are among the list of famous and noteworthy people who are interred here. Allow yourself plenty of time to explore Lake View; there's 285 acres of it! The Italians who emigrated here to do the stonework and landscaping in the cemetery settled in and made the Little Italy neighborhood. Skilled stonemason Joseph Carabelli was one of the first settlers in the area. He immigrated to America in 1870 at the age of 20 and settled in Cleveland ten years later, where he started up the Lake View Monumental Works across from the Lake View Cemetery. 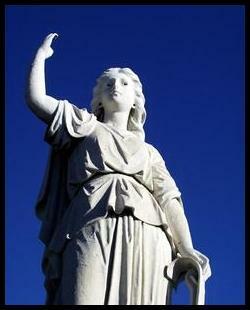 Calvary Cemetery is a very large cemetery founded in 1893. It's located on Cleveland's near East side. Another Calvary website. Holy Cross Cemetery is another very large cemetery that goes back many, many years. It's located near on Cleveland's near West side and is visible from I-480. A well-known West side cemetery is the West Park Cemetery, which was established in 1900 and is 127 acres. The Darrow Family Cemetery is a small, family cemetery located in on Old Rockside Road in Parma. In Middleburg Heights there's Woodvale Cemetery, a medium-sized cemetery over a hundred years old. Some burial records are online. There is a monument there visible from the road that looks like it could have been made by the same man who made Thomas Wolfe's famous angel. St. Adalbert's Cemetery in Middleburgh Heights is a smaller cemetery with many very old tombstones, some unmarked, for St. Adalbert Church in Berea. A listing is available of some of those who are interned there. Cleveland Cemeteries is a book by Vicki Blum about stories of Cleveland's most long-time residents and the places they reside in. The Kirby world-wide headquarters building is located on Cleveland's west side. Kirby's Cleveland manufacturing plant has been producing every Kirby vacuum cleaner model since 1926! Since his first product in 1906, Mr. Kirby always strived to create the ultimate home sanitation device. My favorite vacuum is a Mid-Century model (found at an estate sale - mint, in its original box!) that does just about anything you can think of; it functions as a sharpener and grinder, a wood floor polisher, a spray-painting tool, a de-mothing unit, an upholstery cleaner as well as a vacuum (upright and shoulder carry-able)! The Kirby site has an image of the plant as it looked in 1926. Paramount Distillers dates back to 1934 on Cleveland's near West side just one month after Prohibition was repealed. J.F. Moessmer's company did well and quickly outgrew its modest home on West 106th Street. In 1946, Paramount was movied to its present-day home on Berea Road. Paramount still offers a wide selection of cordials, liquers and other types of alcohol with the same great old-fashioned labels they've had for years. NASA was originally the NACA (National Advisory Committee for Aeronautics). NACA was founded in 1915 and was known world-wide for its highly successful research program in the 1940s and 1950s. In 1958, NACA became NASA (National Aeronautics and Space Administration). The Glenn Research Center, formerly known as the Lewis Research Center, is located on Cleveland's West side, near the Hopkins Airport. 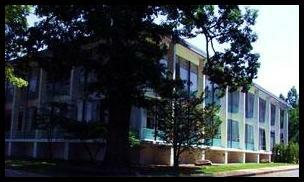 The Lewis Reseach Center was a part of NACA before it became NASA. Research at the Lewis center was a vital part of every US aircraft built since the early 1940s. Lewis also houses the Icing Research Tunnel constructed in 1944 (the world's largest) and the Hypersonic Wind Tunnel (the only tunnel of its type in the US). This facility had been named in tribute to George William Lewis, who made essential contributions to both NACA and NASA. It had a name change in 1999 dropping Mr. Lewis' name. It's now officially known as the Glenn Reseach Center (with a postscript of "at Louis Field"); at the same time, the beautiful rock gardens in the front entranceway have stopped being maintained. This, along with dropping Mr. Lewis' name from the employee newsletter, has upset and insulted many long-time and retired Cleveland NASA employees. Timeline of the National Refining Company which began in Cleveland in 1882. The timeline also includes many images of the beautifully designed letterhead over the decades. Ford Motor Company, Brookpark plant features some wonderful examples of Mid-Century Modern design by architect H.A. Ferguson. Most notable are the main entrances to Cleveland Engine Plant 1 and the Cleveland Casting Plant. The latter has a plaque on the front of the building stating that it was "Designated by the Cleveland Chamber of Commerce as the best factory building erected in Cuyahoga County in the year 1952." The Maywood Medical Building on busy Mayfield Road has baby-blue bricks and cement slab front. The home of Dickson Associates architects and other tenants is a classic, unnamed Mid-Century Modern office building: blocky panels almost like a Mondrian painting, and mosaic of tiles around the steel-framed entrance doors. Everyone of a certain age remembers the inventor of the geodesic dome structure, R. Buckminster Fuller. Sadly forgotten today, and left out of school curricula, Fuller was a comprehensivist: philosopher, inventor, mathematician, architect, designer, scientist, artist. He'd been known as "the planet's friendly genius" and was the author of many popular books, including Critical Path . Today, the Buckminster Fuller Institute keeps his name alive, and has been issuing many of his out-of-print books in free online editions. Cleveland has its share of domes and Fullerian connections, including notable structures designed by Fuller himself. Bucky even had a Cleveland architectural office. The ASM International Dome is a beautiful example of an open-air geodesic dome. At the space-age headquarters of the American Society of Metals, the dome itself houses an interesting display of different rocks and metals. This dome is the largest of its type in the world, and was designed by Bucky. No matter how many times I visit this dome, standing inside and looking towards the sky always leaves me speechless -- it is truly amazing! According to this article, the CSU dome could be in danger: "The first thing that can be put up is the recreation and wellness center," Boyle said, explaining that the facility could be on the site of the Intramural Sports Center. "If we can relocate the activities in that facility, we could tear down the dome and start the wellness center in the spring or summer." Westlake's Crown Water Treatment plant is home to geodesic domes which are visible most clearly from Detroit Road just east of Clague. It's hard to miss the facility -- just look for "CROWN FILTRATION PLANT" in beautiful large bold lettering on an equally Modern building. Sadly, as part of a renovation program, the stylish old sign once facing the road was replaced with a new bland sign with generic lettering. Some historic homes have become area museums open to the public, while others remain private residences. Examples of the former include the Old Stone House and the Nicholson house, both maintained and operated by the Lakewood Historical Society. In Cleveland, you don't have to look too hard to find some of my favorite residential architecture -- the "California Ranch" style homes of the mid-50s through the early-60s. Hot spots include Bay Village, Parma and North Olmsted. It's no wonder there are so many stylish "long and low" ranches (also known as "butterfly" roofed homes) to be found in the suburbs of Cleveland -- John Eversole Fennacy, architect and inventor of the California Ranch Style, was born here! One of the best neighborhoods of glamorous California Ranch homes in the Cleveland area is historic Dover Bay along Lake Road in Bay Village. If you look hard enough, you might spot a few Lustron homes in the area, which were popular build-it-yourself "kit" houses after World War II, and were manufactured in Columbus, Ohio. The walls and the entire home are made of painted metal panels and porcelain enamel; the modest, prefabricated homes were designed for affordability and easy maintenance. Today these homes are sought after; there is an active Lustron discussion group, a conference in the Lustron Corporation's hometown, and a book by Thomas T. Fetters et. 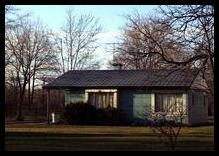 al, Lustron Homes: The History of a Postwar Prefabricated Housing Experiment . Cleveland has a number of noted historic neighborhoods, each with their own unique qualities. The venerable Cleveland Botanical Garden offers a beautiful and extensive sampling of flora both native and foreign (including aquatic species), herbs, and flowers that thrive in outdoor Cleveland conditions. The Garden first started out as a library resource, in a little boat house on the lagoon behind the Cleveland Museum of Art, across the street from Severance Hall. The Botanical Garden moved to their current site on University Circle in 1966. The building and grounds had a sublime, period feel that had gone unsullied through the decades. This stone-fronted modern building featured Eames-era furniture and modern interior. The botanical library is noted for rare, out-of-print books. This exceptionally preserved landmark building and grounds has unfortunately been compromised for a trendy renovation and artificial tropical biome, which ostensibly brings the environment and flora of Madagascar and Costa Rica to anywhere -- but forgets the environment and flora of Cleveland, which is not available anywhere else. This was once my favorite retreat but that sublime element has been lost. The Cleveland Cultural Gardens is a collection of gardens representing the many different ethnicities that make up Cleveland and its suburbs. The Holden Arboretum was established in 1931, thanks to a gift from Albert Fairchild Holden. Originally, Mr. Holden planned to found his arboretum at Harvard University, but his daughters had convinced him that the Cleveland area deserved an arboretum of its own -- hence, its Kirtland home. ID guides (to aid you in your visits) are available at the adjoining Warren H. Corning Library, along with many other invaluable books on the topic. Stan Hywet Hall & Gardens was formerly the estate of F.A. Seiblerling, the founder of the Akron headquartered Goodyear Tire & Rubber Company. In 1912, Mr. Seiblerling commissioned architect Charles Sumner Schneider to create his Tudor Revival style "country house." This National Historic Landmark mansion and its gardens are now open year-round to the public. Guided tours are available. There is a list of near-by area gardens to visit, which comes compliments of the Garden Club, "The Internet's Garden Club Community." The Cleveland Metropolitan Parks System (more commonly known around town as "the Metroparks") spans from the East side to the West, north to south, forming an "emerald necklace" around the city. This park system also runs the Cleveland Zoo. There are many public trails and nature centers throughout the park's various reservations. The Huntington Beach Reservation in Bay Village, the former site of the John Huntington estate and its neighboring parks are straight out of the pages of Fitzgerald; the city has a FAQ on the area and a page of postcard views. Although Euclid Beach Park (EBP) hasn't been around since 1969, there is still a group of folks who keep their fond memories of the "the Beach" alive through a group called the Euclid Beach Park Nuts who are also working on establishing a Euclid Beach Park museum. Euclid Beach was established between 1895 and1901 on Cleveland's East side. Although it was torn down before I was born, I've heard nothing but postive, joyous memories of EBP. The same Humphrey Company that supplied "the Beach" with its famous popcorn balls and other treats still offers these edible memories at local grocers and also on their Web site. Other nice articles and sites about the history of Euclid Beach Park have more photos. Memphis Kiddie Park, on Cleveland's near-West side, has delighted children since 1952. It is wonderfully vintage today, with all the old signs and atmosphere. This seasonal outdoor park is a children's style "Cedar Point" with miniature roller coasters, tiny ferris wheels and other kiddie-style rides. One of the coasters, the Little Dipper, dates back to 1952 and is said to be the oldest still-operating steel coaster in the world. In 2003, the Sun News published an article about the park. You don't have to be a resident of Lakewood to enjoy its landmark of nearly three quarters of a century, Winterhurst Ice Rink! In 1931, the City Ice and Fuel Company created Winterhurst -- the largest outdoor artificial ice rink in the US. Winterhurst's current indoor facilities were built in 1975 and to this day, it remains one of the largest year-round ice skating rinks in the country. The Western Reserve Historical Society (WRHS), founded in 1867, presents many educational programs and displays about historic Cleveland and northeast Ohio. The Berea Historical Society was established in 1959 by the local historian Dorothy Marks McKelvey. You can view their collection of the city's artifacts in their Mahler Museum & History Center within walking distance of Berea's downtown area. The Little Italy Historical Museum is a showcase for Little Italy's rich history. Located on Mayfield Road, Little Italy's main drag, this museum archives the fascinating past of a city that was a crucial part of early Italian (and Sicilian) immigrants lives and remains an important part of Clevelanders with Italian roots to this day. The Lakewood Historical Society offers a comprehensive Web site detailing the city's impressive history. The Oldest Stone House serves as a museum for the historical society. This museum was built in 1838 and, until 1870, was a home on Detroit Avenue. Another historical Lakewood building (associated with the Historical Society) not to be missed is the Nicholson House. The Nicholson House, a fine example of authentic New England architecture, was built three years before the Oldest Stone House and is Lakewood's oldest remaining building. Slavic Village Historical Society is at the Mill Creek Falls History Center. Bay Village has historic homes in their Cahoon Park area which are sometimes open for tours. Fighting to save and preserve landmark buildings and historic neighborhoods since 1972 is the Cleveland Restoration Society. This nonprofit offers help with your historic building. Membership includes publications and events. Some events open to the general public. Also publishes annual Preservation Awards; their 2003 Preservation Awards included several local homeowners for the preservation work on their historic homes, as well as larger architectural landmarks. The Recent Past Preservation Network, a non-profit organization, plays an important role in preserving and bringing awareness to historic properties and landmarks of the Modern period -- those less than one hundred years old. DOCOMOMO US: documentation and conservation of buildings, sites and neighborhoods of the modern movement: preserving the high point of modernism. This is the US branch of a worldwide organization. The Society for Commercial Archeology, established in 1977, is the oldest organization of its type. SCA specializes in preservation of commercial roadside architectural landmarks. Membership includes yearly conferences and a quarterly journal. Scenic Ohio, originally known as the Ohio Road Side Council, was founded in 1933. This mission of this not-for-profit is "to preserve and enhance the scenic character of Ohio's communities and countryside." There is a public list of the Most Endangered Ohio Sites, which comes compliments of the Ohio Preservation Alliance -- "Ohio's Independent & Oldest Statewide Historic Preservation Organization". Traditional Building is a resource for locating the perfect vintage building materials -- ornamental metalwork, classic doors, floors, plumbing fixtures and whatever you might need for restoring your historic home or building. Unfortunately, too many Modern Cleveland favorites are no longer with us. The R.I.P. pages are for remembering those special places that are no longer extant. For an impressive record of historical Cleveland places and events, check out the Encyclopedia of Cleveland History and a collection of historical images. The Cleveland Memory Project, a "showcase for the special collections of Cleveland State University Library," offers a comprehensive history -- including 10,000 vintage images -- of Cleveland and its surrounding suburbs. They also host the Cleveland Digital Library. The Library of Congress site is a wealth of information! For over 50 historic images of the Cleveland area, go to this LOC site and search "Cleveland Ohio." Cuyahoga County Ohio's Genealogy and History site has a collection of postcards relating to Cuyahoga County from years gone by, including views of Cleveland and penny postcards from Ohio. Cuyahoga County Ohio's Genealogy and History site is all about the people and places of Cleveland: Births, Deaths, Cemeteries, Census, Societies, Maps, Marriages and more! Forgotten Ohio tells the stories of Ohio's haunted houses and deserted buildings. ArchINFORM (Germany) has a Cleveland architecture guide. Timeline of E.W. Scripps -- better known to many Clevelanders as Scripps Howard, the media company that ran WEWS and The Cleveland Press and had its national headquarters right here in Cleveland. Broadcasting since December 1947, WEWS was the first television station to broadcast in Ohio. Today, NewsNet5 offers a timeline of their first fifty years. One of their guests of honor at their first Christmas party was none other than Jimmy Stewart!